One of the hardest parts about running an online store is to get people coming to your site. But how many of them actually buy your products? Customers make purchases when they feel safe, comfortable, and that they can trust the seller. We’ve put together a few tips to help you increase your store’s conversation rates, in other words, get more sales from the traffic that comes to your store. Part of the cost of purchasing a product is also the shipping. In fact, a lot of people factor in the shipping cost as part of their decision in purchasing your product. If a customer doesn’t see the shipping information on the product page, they’d assume it would show up in the checkout. But some people don’t like to have to go through to the checkout just to see the shipping information. If your shipping prices aren’t clearly stated throughout the purchasing process, customers might become confused or frustrated and leave your site. Example: Amazon clearly displays their shipping fees next to their product prices so customers don’t get a surprise when they go through the checkout. I know, this seems like an obvious one. But you’d be surprised how many people simply upload a picture and a one line description. Since your customers can’t view your product in person, the more information you can give them, the better. Try to include video, pictures, and detailed written descriptions, including size and weight. People are more likely to buy from a site that gives them a good idea of what they’re getting. The more information they get, the closer they feel to the product. Giving more information also means less questions you have to answer, as well as less returns from customers because they know what they’re buying and how it works. The more ways you can present and describe your product, the better. 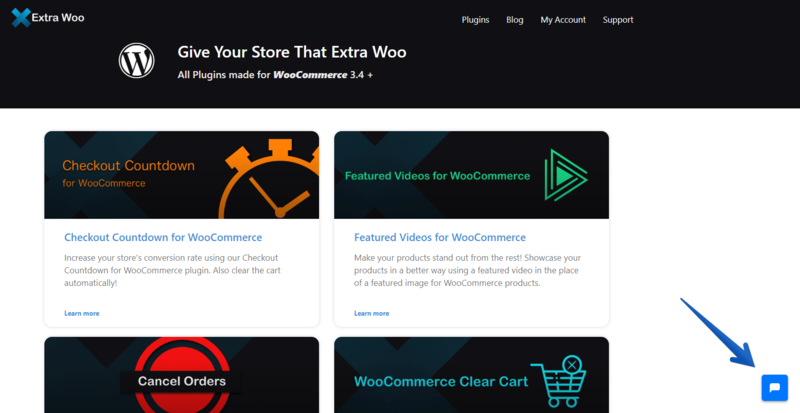 Check out our Featured Videos for WooCommerce plugin if you want to easily put a video on your product page! The easier it is for customers to buy your product and the less information they have to put in, the better. People can easily get overwhelmed and leave your site if they feel like they have to give out too much personal information. This could be either because they can’t be bothered filling in all the boxes, or it could be because they’re uncomfortable giving out personal details. As business owners, we love to know as much about our customers as possible, but there could be a cost to forcing them to give out too much personal information. We get that sometimes you have to get customers to make accounts because it’s the only way for them to be able to manage their payments, cancel subscriptions and manage product licences. One way to get around this would be to automatically create an account for your customers using their email address. You can then send them a random password along with their purchase receipt that they can use to log in if they want to. Another way to get around this is to give customers the option to check out as a guest. 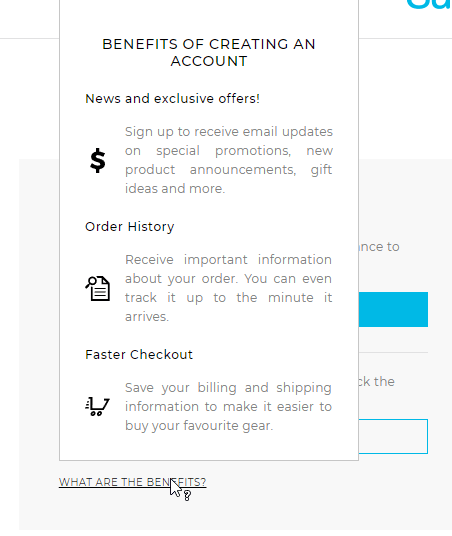 You can always try to get them to create an account after they’ve checked out by reminding them of the benefits of having an account – maybe it’s a discount next time, maybe it’s being able to purchase items more quickly in the future, maybe it’s to collect points for a loyalty program you have. Then give them the another opportunity to create an account. But, if you don’t need customers to have an account, it’s probably better not to scare them away by forcing them to make one! 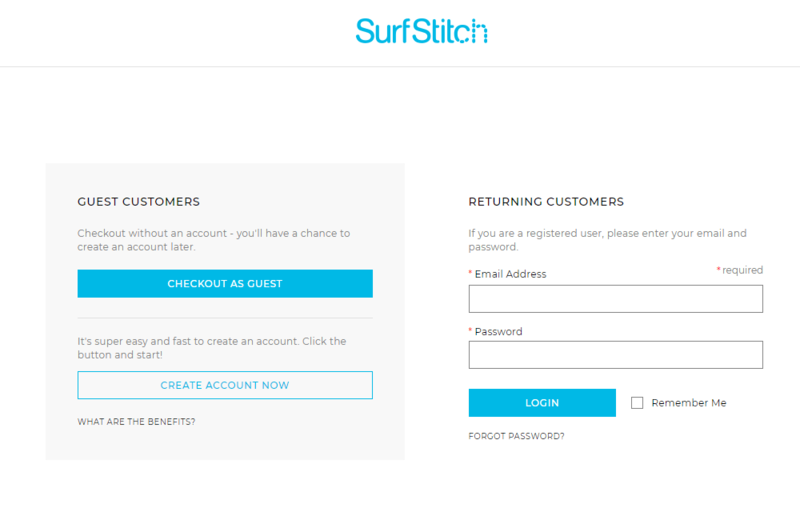 For example, Surf Stitch has a little tooltip that tells you the benefits of creating an account now. People are more likely to buy items quickly when they think they might miss out. Using something like a countdown in the checkout gives customers a sense of urgency that they might lose out on your products if they don’t make up their mind fast enough. This can work especially well with things like ticket sales where you only want to allow customers to hold their tickets for a certain amount of time before they need to make a choice to either buy or release them for other paying customers to purchase. 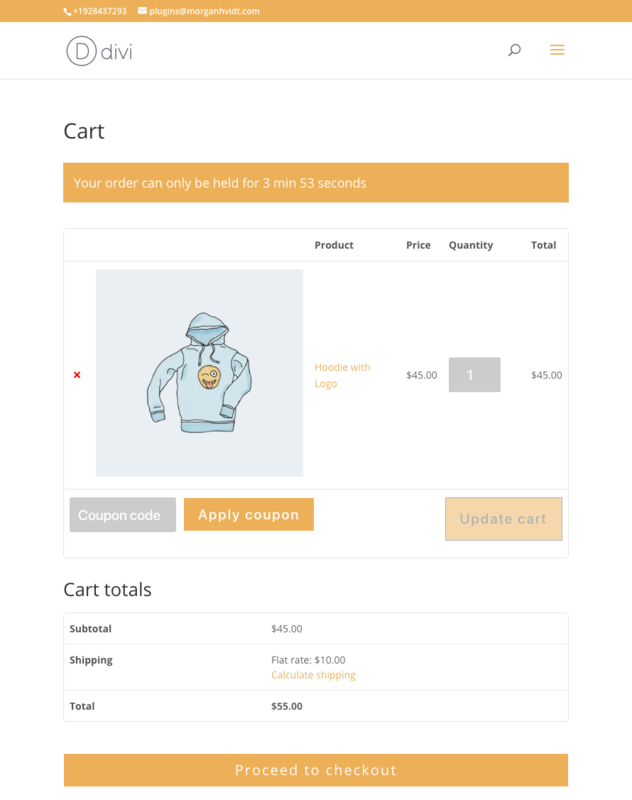 Example: Our Checkout Countdown plugin is great for adding a countdown banner to your WooCommerce store cart. Test your checkout process on different devices – how does it work on mobile phones or tablets compared to a computer? How easy is it to navigate back and forth between the different steps in your checkout? If someone presses the back button on their mobile phone, will they lose all their checkout information and have to start again? 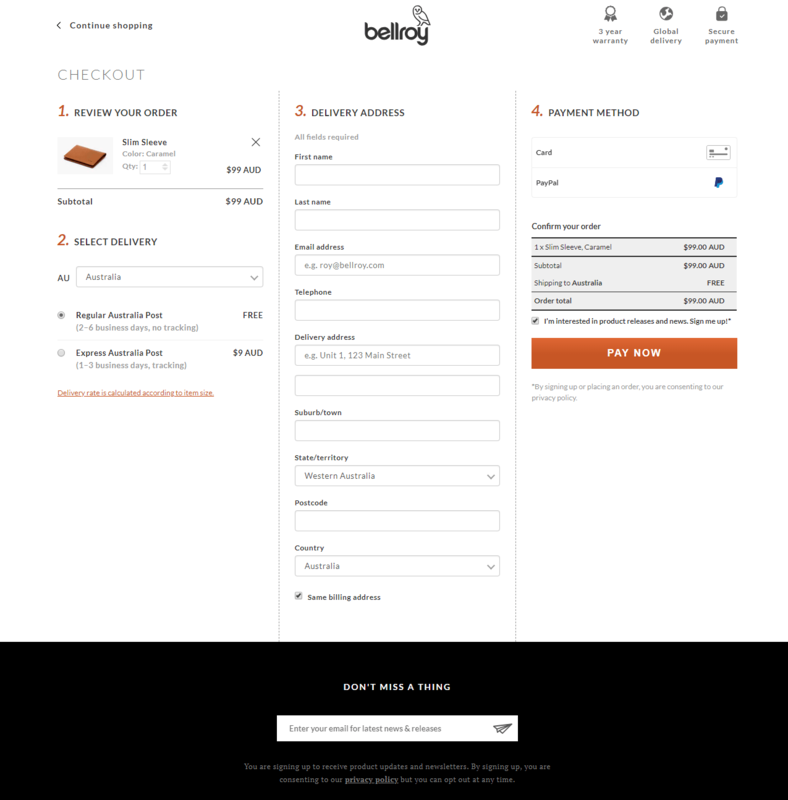 Example: Bellroy’s checkout page is a good example of one that would work well on a computer screen. All the steps are on one page and customers don’t have to click through various pages as they go through the checkout. This is super good for customers using computers because they can see all the information that is required of them straight away. Bellroy also has all the checkout steps on one page on mobile phones, but the layout is a little different so it’s easy to use. It definitely wouldn’t work well if the checkout looked the same on a mobile phone as it does on a computer. People generally don’t like having to enter their credit card details into an unfamiliar website. Give customers a payment option that they consider to be safe. Everyone knows of Paypal, and most people trust it too because they don’t have to enter their credit card details. We know Paypal isn’t the best option for sellers because they tend to have higher fees than other less known competitors like Stripe, or some of the smaller companies. But, customers may be more reluctant to use something they aren’t familiar with, so it might be a better option to grin and bear those extra fees just so you can get the extra sales. An SSL is a security certificate you install on your server that encrypts the information that’s passed between the customer’s browser and your server. This is basically a must on all online stores now. If you don’t have it, customers might see this come up when they try to visit your site and be scared away! 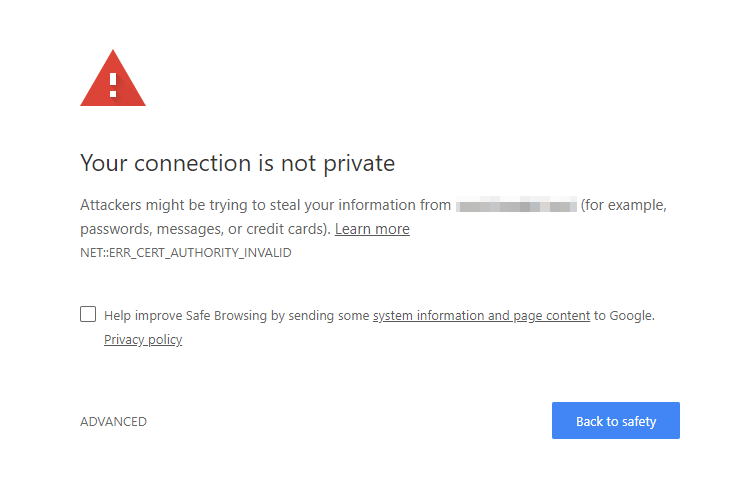 An SSL certificate is indicated on a site with the little padlock next to the URL of the site. Without this, your site won’t seem trustworthy, and rightly so – without an SSL certificate, anybody could read and track your customer’s passwords and credit card information. You set this up through your hosting provider. Reviews create trust. 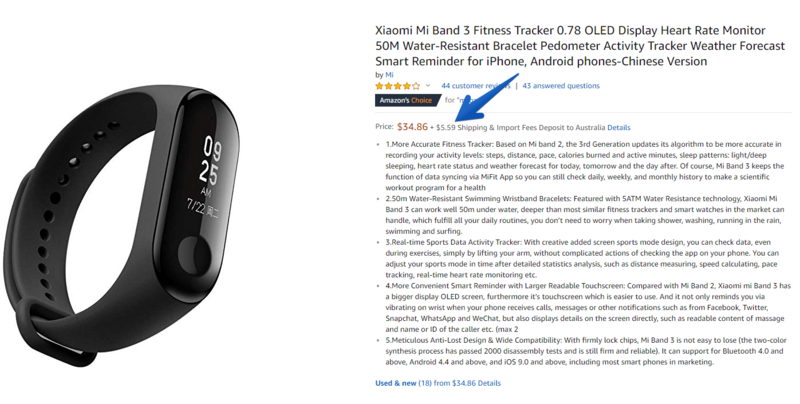 A lot of people look at the reviews on products before they buy. The downside here is if you get negative reviews. There will always be that one person who’s just unhappy with everything. If you get a crazy negative review, make sure you respond in a reasonable manner. Customers are likely to see you as being more genuine and responsive if you do respond in a decent way. In fact, it might even make other customers like you more. If someone has voiced a genuine problem, be sure to leave a comment thanking them for their review and assuring them that you will fix the problem. Having an active presence in the reviews section can work wonders for your customer base. Sometimes people will use a review as a way to contact you if it’s too hard to find a way to contact you privately. To lower the chance of getting unnecessary bad reviews, make sure it’s easy for your customers to contact you if they have any issues. If it’s a choice between a company that responds to my questions quickly versus one that’s super hard to contact, I know which one I’d go with. Having a fast method of contact builds trust and loyalty, especially if it’s a human connection. Customers want to be able to get the help they need when they need it. The best contact options include phone numbers or live chats because they’re the quickest ways for customers to get in contact with you. As far as live chat apps, we recommend Drift or Crisp. Example: This the live chat button on our site, which is powered by Drift. You don’t necessarily need a live chat. But if you don’t, then we’d recommend having a phone number listed. Email is another option. It’s great too, but it’s also a slower form of contact and you might lose out on sales to competitors that have quicker ways for customers to get their questions answered. Monitoring how people use your site can help you to figure out what your customers care about and which parts of your site they spend the most time clicking on, hovering over, or scrolling through. Using tools like these, you can also identify where in your checkout process your visitors are dropping off, which then allows you to improve that area of the site. Another popular heat mapping tool is Crazy Egg, which has a free 30 day trial – test it out and see if it works for you. This tool shows you where users have clicked on your site and color codes the page to show which parts are being clicked the most. The downside to using some of these tools is that they can slow down your site because it’s extra things to load on top of your existing site. But they can be useful to help you identify the areas of your site that need improving – you just might not want to leave them installed forever. Shopping online is risky business – what if you buy a pair of shoes that don’t fit you? People like to feel like their purchase is risk free. which means having the option to get a refund if the product doesn’t work for them. You don’t necessarily have to offer free return shipping, but make sure your return policy is clear and easy to understand. If you are easy to deal with, customers are much more likely to want to buy from you! Don’t be afraid to display your return policy! Customers want to see it! It makes them feel safe. Also, try to write your own returns policy – using a template is fine, but copying and pasting from another site will ruin your SEO because you’ll have duplicated content on your site. To make yourself look even better, you can include testimonials from happy customers who have returned their product to you. Seeing that someone else was able to return their product easily with no fuss will make shoppers so much more comfortable with buying from you. 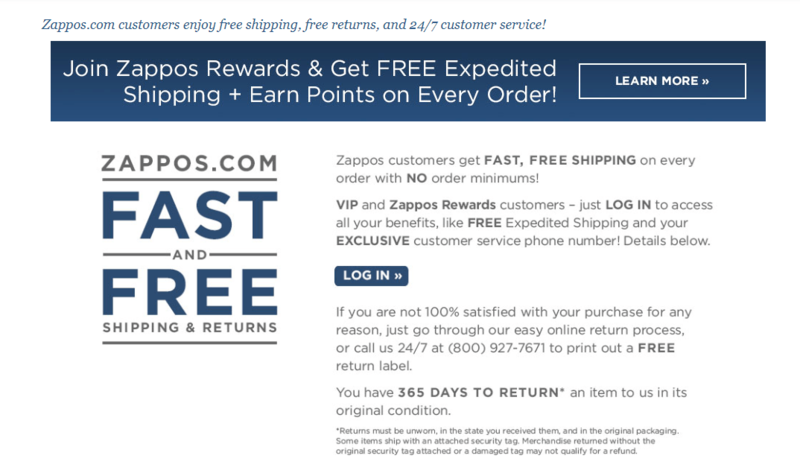 Example: Zappos has a short and simple return policy – fast and free returns and shipping. In an ideal world, customers would just buy our products with no questions asked, but sometimes the best way to build trust is to offer a trial or a free sample. Now, we know that there are always going to be people who abuse these offers, just like there are people who abuse the returns policy, but there are plenty of genuine customers who would love to try before they buy. If your product is a digital one, you might even consider having a limited free version that customers can try and then upgrade to the premium version if they need to. 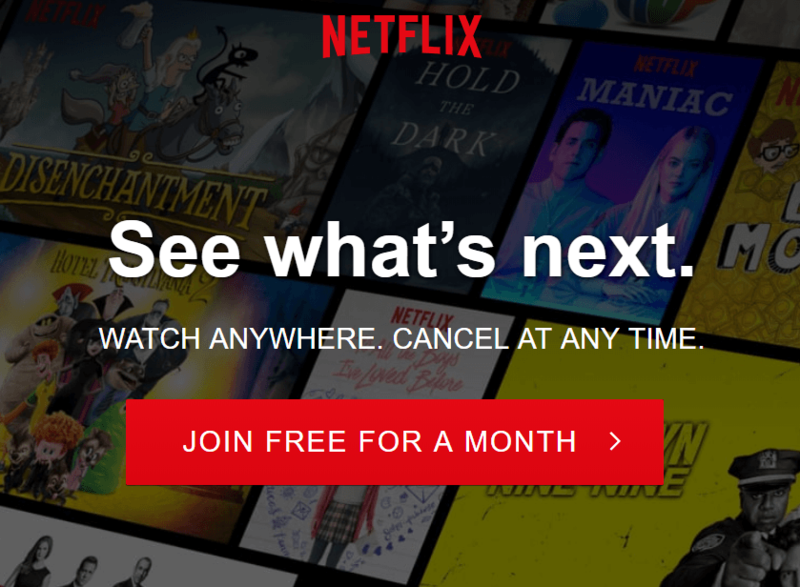 Example: Netflix offers a free month for anyone who wants to try it out. It’s a good deal until your month ends and you haven’t finished the exciting show you were watching – then you have to purchase a subscription, and that’s how they get you hooked! People are much more likely to spend money when they think they’re going to save money. It’s a weird concept, but it’s true. People love spending to save. Who doesn’t love a good discount? 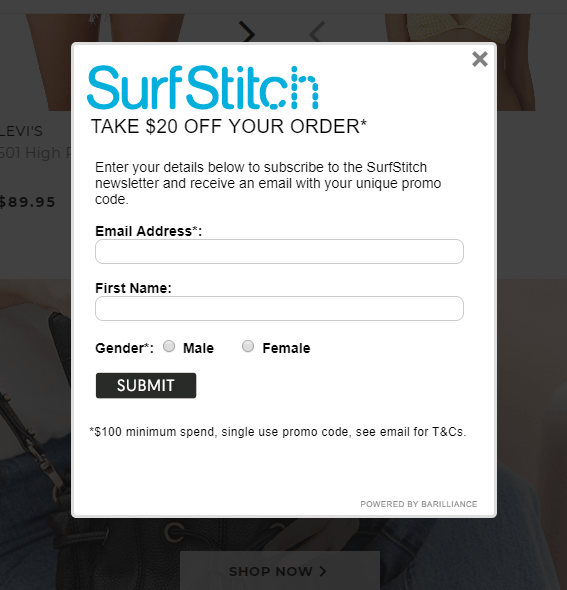 Example: This popup on SurfStitch’s site offers to send you a coupon for $20 off your first order if you enter your email address. The catch is, you have to spend $100. Spend more to save more! We hope these tips have helped you or at least given you some good ideas! Don’t forget to check out some of our plugins here at extrawoo.com – we’ve designed them specifically for increasing your store’s conversion rates!